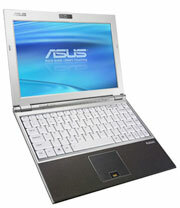 HotHardware has published a new review of Asus’ ultraportable U6S. As the review notes, the ASUS’ U series is geared towards those looking for a bit of style in their ultraportables. The U6S has a 12.1″ LED-backlit widescreen display, with Magnesium-alloy lid, an HDMI port, a leather-bound palm rest (yes, you read that right, leather), and with it’s Nvidia GeForce 8400M G graphics chipset, it supports DirectX 10. Because of the graphics hardware, as well as the regular mobile Intel Core 2 Duo CPUs, it does well for games in it’s class (let’s face it, most ultraportables do not do well in gaming and 3D benchmarks), but by the same token, those two factors can hurt the battery life, and as the review mentions, this makes the U6S more of a “fully-featured” ultraportable compared to most in its class (who use lower voltage CPUs, etc. ).